Ninjaman & Downsound Records Making A Difference | Celebrity Plus-Again! Life in Jamaica for many is a day to day struggle. Making ends meet is not always possible for many hard working men and women. Often times, some just need a break. A head start…someone to believe in them. Downsound Records and Ninjaman recently held an event which peeked my interest. The event was dubbed, the “Taxi Operators Appreciation & Family Fun Day”. Wow…that’s some title. I was immediately intrigued and couldn’t wait for August 2nd to roll around. I was unable to attend the event, but I hounded some of the Downsound staff asking for photos and information about the winner. Why was I so excited? Why did the winner(s) interest me so much. Well, I’ll tell you. I feel deeply for others, and love to see lives being changed for the better. I had never heard of an event showing love to the taxi drivers, you know, (some) of the people who risk their lives daily in an effort to keep Jamaica moving. Many taxi drivers on the island can’t afford their own vehicles and drive (at a cost), the vehicles of others. 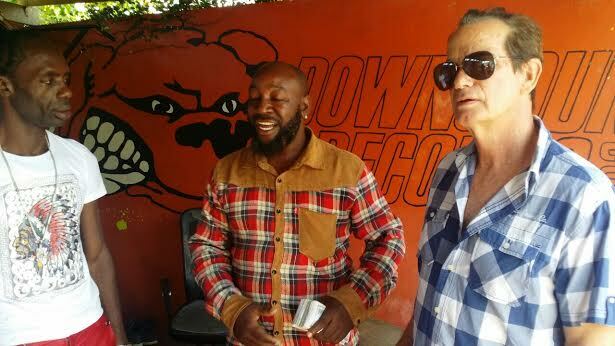 As a grand prize, Downsound Records was giving away a brand new Nissan, and all a taxi operator had to do was be skilled in toasting. The dj skills haffi tun up! With veteran dancehall artiste Ninjaman overseeing this event, contestants had to come correct…or step. 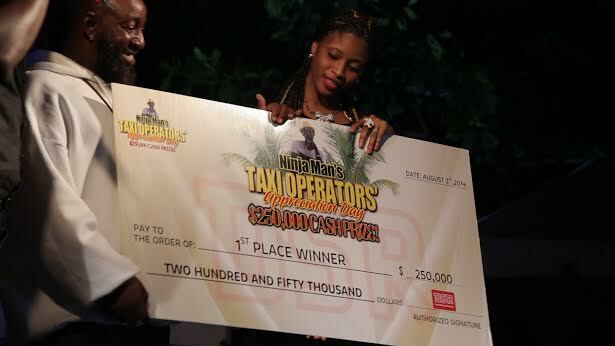 “Keith Black, a taxi driver who plies the Mount Salem to Montego Bay route, won the Ninja Man taxi appreciation day talent competition Saturday night at Turtle River Park, Ocho Rios. Black, stage name ‘Zedek’, was pushed all the way by runner-up Donovan, emerging victorious with well-put together lyrics, earning a two-record and video deal, plus $250,000. Though not originally part of the deal, Donovan earned a two-record deal due to his good performance on stage. The Downsound Records event attracted more than 100 taxi operators, narrowed down to 15 for the finals. After 11 performances, the Don Gorgon, Ninja Man, was not pleased with the level of talent shown and made his feelings known. 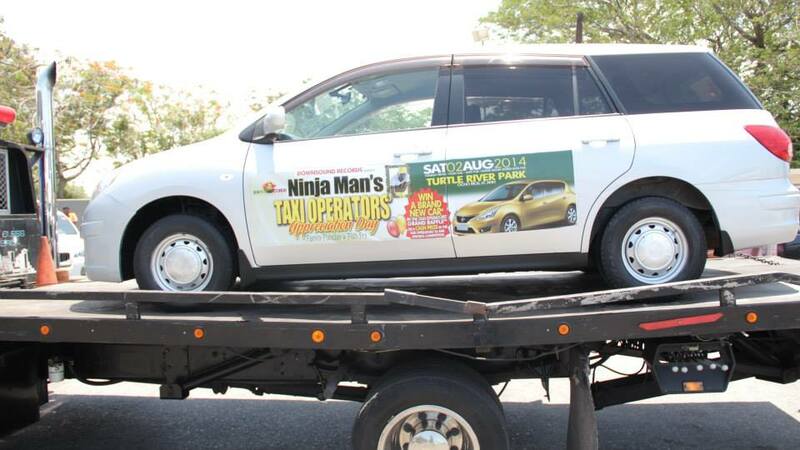 Ninja Man got what he demanded from the remaining cabbies. In the end, it was up to Zedek and Donovan to fight for the prize. I applaud Ninjaman and Downsound Records for thinking outside of that proverbial box. Undoubtedly, Keith Black and Donovan the two winners, will not be the only persons benefiting from this event. It’s all about community and family. It has to be…someone has to care. Ninjaman might be the front teet, gold teet, gun pon teet, Don Gorgon, but people need to look deeper. What a kind soul! Who is the dj who is always turning the other cheek and endorsing love among his peers? Who is the dj who says what he means and means what he says…without apology? Who is the people’s dj? Who is the family oriented, always worried about the citizens of Jamaica dj? The always giving advice to the youths dj? Ninjaman…your bark is worst than your bite and we love you for it, because we see your heart. I have to also big up Joe Bogdanovich and the entire Downsound Records staff. This label is ‘people’ driven, not ‘money’ driven. Search YouTube and Google if you think I’m playing. Who is always performing at charity events and schools? Who is always doing for the community behind the scenes? Downsound Records is a force…a driving force in Jamaica. We need to recognize. I sincerely hope others in the position to make a difference, will. These are my (Shilo’s) thoughts. Opinions expressed here in this blog are mine and mine alone. An independent thinker who takes pleasure in exercising her right to free speech. This entry was posted in Feature, Shilo's Opinion. Bookmark the permalink.